AMD is pretty much the king of the budget performance segment. Its range of APU’s has been highly successful both in mobile and desktop form and provide the best bang for your buck. In case you’re not aware, APU stands for Accelerated Processing Unit, which is a combination of CPU and GPU on a single chip. This not only helps keeps costs down, but it also consumes lesser power. Yes, they aren’t going to win any fastest processor awards, but at the price they come, you just can’t go wrong. 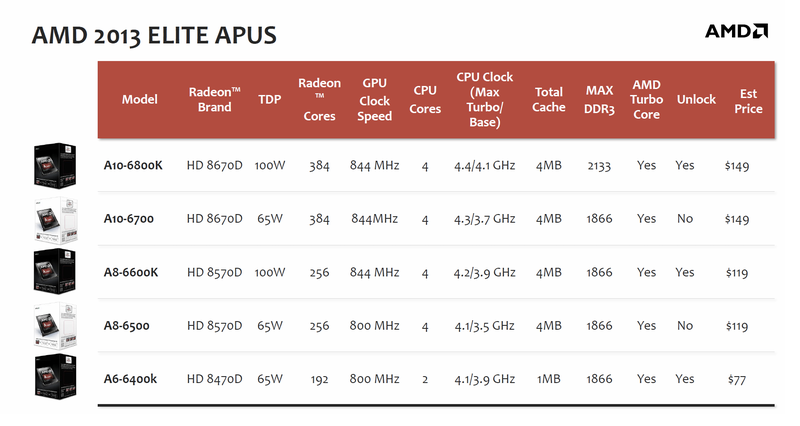 AMD launched the new generation of desktop APU’s today, codenamed Richland, now known as AMD A-Elite Series. The “K” denotes an unlocked multiplier, so you can overclock it quite a bit, which is what AMD processors are known for. Now here’s the best part, you can actually play the newest games on 1080P or 720P resolutions at low to medium settings on the top end processors. Games like The Elder Scrolls V: Skyrim, Left 4 Dead 2 and lighter games can actually run on high settings, at 1080P. Can’t really beat that sort of performance at the price. If you decide to throw in a dedicated graphics card like an AMD Radeon HD 7770 or something similar from the mid range, you get a pretty decent gaming machine without breaking the bank. Even Intel is going the same way by including an upgraded integrated graphics solution on its Haswell range, so APUs are really catching on. While the new range of APUs are already available online in US and Canada, you can expect them in India by the next month. Even though some Haswell processors will include the integrated graphics, they are only just coming into contention with AMD’s APU graphics performance wise but are still more expensive. So for now, the APU range still hits that sweet spot of price versus performance. Do drop us a line on what you think of the new AMD Richland Desktop APU range!